These two events are held on the same day, usually the first or second Saturday in March. The fee for each participant is $15.00, which helps to pay the judges and cover expenses. Students play two pieces of contrasting style and period and receive a comment sheet and rating from an impartial judge. Those students who participate in Auditions compete with other students in their grade level for the opportunity of participating in the Georgia Music Teachers Association (GMTA) Regional and State Auditions. Those students who participate in Solo Festival do not compete, but receive a comment sheet and a rating. Each rating carries a numerical value and students are encouraged to accumulate points toward trophies, as described under the heading “Trophy Incentive Program”. Students can also take the State Theory Test at this time. This annual event takes place at Reinhardt College. It is a celebration for students who are receiving trophies through points earned in auditions and solo festival, and the recipient of the Summer Music Camp Scholarship. Events of the evening include presentations of trophies and scholarships, performance by scholarship winner, recital by a guest artist, and a formal reception. CMTA encourages its members to seek national certification through Music Teachers National Association. CMTA sponsors an annual Masterclass in which up to 8 students can perform and receive instruction from a clinician. The clinician is usually a piano professor from a college or university in the state of Georgia. Entrants submit a recorded performance of the piece they would like to perform, along with a $10.00 entry fee, and participants are chosen from the tapes or CDs submitted. This event is open to the public. CMTA has a mentoring program where new members can receive help with policies, procedures, and activities during the first couple of years. Students of CMTA members perform on keyboards and other instruments at the mall entrance to Belk’s Department Store at Town Center Mall. Students pay $10 each and can sign up to play as many pieces as they wish. Music does not have to be memorized and various styles of music are acceptable. The proceeds help to fund the CMTA Summer Music Camp Scholarship. This event usually takes place the second weekend of December. Each year, high-school age students compete for this prize at the Spring Auditions by performing two pieces of contrasting style and period for an impartial judge, not affiliated with CMTA. Each student’s teacher also writes a letter of recommendation, naming the student’s achievements in academics, music, and involvement in extra-curricular activities such as church, sports, social work, and hobbies. The judge then chooses the recipient of the scholarship plus an alternate, based on the performances and the letters of recommendation. 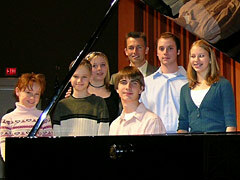 Students may compete in any instrument or voice. The winner is awarded a check in the amount of $350.00 to go toward expenses for a summer music camp of the student’s choice. CMTA began offering trophies as an incentive for students to strive for excellence in music performance and music theory. During the annual Spring Auditions and Solo Festival, each student who performs is given a rating which carries a numerical value. At the annual Awards Ceremony, CMTA awards 15-point, 30-point, and 45-point trophies in performance and music theory.